Kale is one of those “superfoods” that has been awesomely hyped in recent years (and yes, it totally deserves its reputation; in fact, I wrote a whole post on why it’s so awesome: Kale: Superfood and Delicious Too!!). Kale is a member of the brassicaceae family of plants, so its relatives include Brussels sprouts and cabbage. It’s actually been incredibly popular throughout the ages; in fact, it was one of the most common green vegetables in Europe until the end of the Middle Ages, in part because it grows easily in slightly chilly environments and can tolerate the frosts of early winter. Because of its popularity, there are many varieties of kale. Curly green kale is what you might most commonly think of when you peruse the vegetable aisle at the grocery store. You might also find lacinato or “dinosaur” kale, which has darker green leaves and a sweeter taste. Red kale is another popular option— you’ll know it by its beautiful dark red color. There are slight differences in the nutritional profile of these varieties, especially when it comes to phytochemicals (the compounds found only in plants that are most notably oftentimes antioxidants). Like many of the leafy greens, kale is an awesome source of both vitamins and minerals. A 3.5oz/100g serving of spinach provides an excellent source of vitamins A and K (keeping in mind that these plant-based sources are not as easily-used in the body as sources from animals) as well as vitamins C and E. Kale also provides a wonderful source of several B vitamins (most notably, folate, which is incredibly important for liver health and for women of reproductive age). Kale also has an abundance of minerals, including manganese, magnesium, iron, potassium, and calcium. Kale is also, of course, a great way to get more fiber. 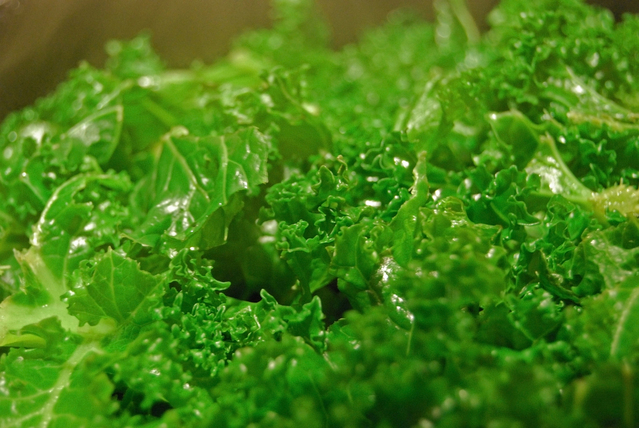 Kale is also a super source of carotenoids, notably lutein and zeaxanthin. Like other members of the brassicaceae family, kale is sometimes mentioned as a potential goitrogenic food (meaning that it can cause a goiter or overgrowth of the thyroid gland). This concern is related to its containing the antinutrient glucosinolate. However, research has shown that this compound is only goitrogenic in people who might be particularly prone to thyroid disease (a family history or a diagnosis related to thyroid health). An important factor in considering your source of kale is that kale is on the Environmental Working Group’s “Dirty Dozen” list, meaning that it is most likely to have been exposed to a lot of pesticides. If you’re concerned about autoimmunity, systemic inflammation, or detoxification, it might be worth it to opt for organic when picking up your kale. You should note that local, organic kale grown in nutrient-rich soil will be especially high in minerals; stopping by your local farmers’ market is your best bet for finding the freshest, most nutrient dense kale! Since kale is a low-temperature crop, the freshest, most tender kale can be found at farmers’ markets and in late fall and early winter. You can also find kale at any grocery store.